Ectopic Rac1 activation disrupts pioneer axon selection, related to Figure 9. Excerpt from a 24-hr DeSOS timelapse movie of a Tg(sox10:lifecat-GFP); Tg(sox10:PA-Rac1) animal exposed to 445 nm light every five minutes. Z-stacks were collected every 5 min starting at 48 hpf. 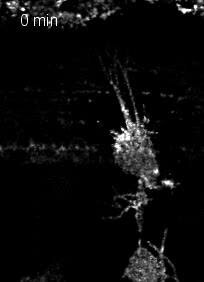 Photoactivation of Rac1 results in a hindered ability for the DRG neuron to select a pioneer axon.